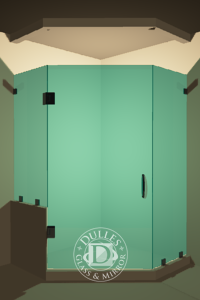 The three glass panels hinge together with glass-to-glass hinges. 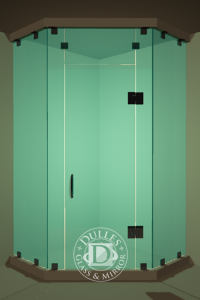 The center panel is, in most cases, the door. 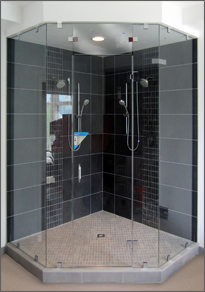 Sturdy hardware between the glass panels, and between the glass shower panels and the walls are very important for the overall stability of the neo angle shower. 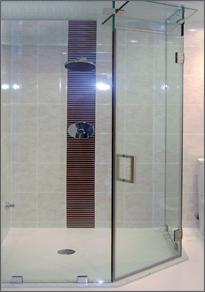 A neo angle shower door has many variations. 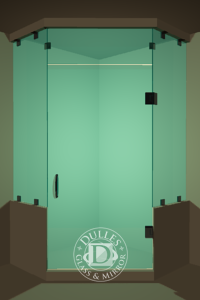 There can be 1-3 glass panels in the front, depending on the width. 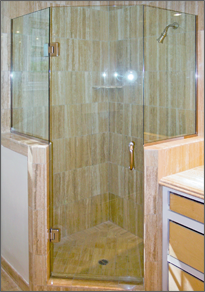 There might be a header bar used if the neo angle shower enclosure is especially large. 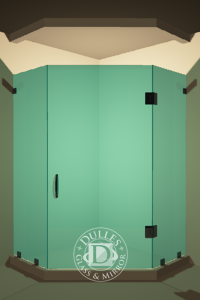 This supports the glass panels more efficiently. Finally, your shower design may require half, or "knee" walls, on one or more sides. 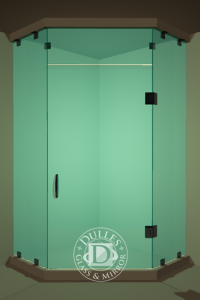 The beautiful diamond shape of the neo angle shower makes it a fantastic choice for larger bathrooms. 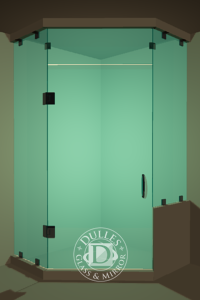 But the way these shower enclosures fit snugly into a corner make them very versatile for small bathroom spaces as well. 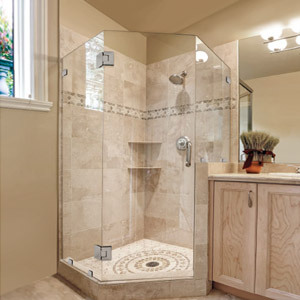 Homeowners with older, more unique spaces will find the neo angle shower enclosure suitable for small bathrooms, attics, remodeled bathrooms, and more. 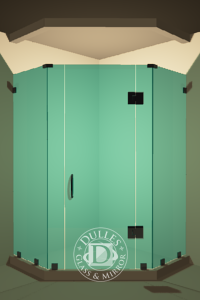 The top glass panels of your neo angle shower could be cut to fit into dormer areas or small spaces with irregular or sloped ceilings. 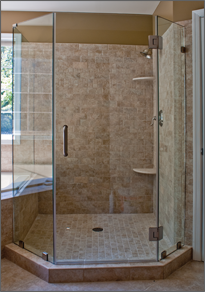 The special types of hinges we use ensures that your neo angle shower stays together firmly and that the doors will open and close easily for years to come. 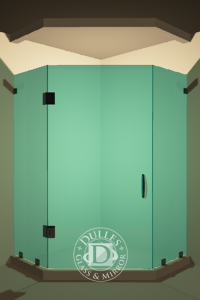 Many people find themselves with a home that is "new to them" but features an outdated framed style of neo angle shower enclosure. 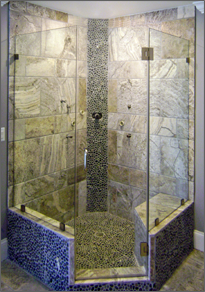 Heavy brass or metal frames with tracks that attract dirt, moisture and mold; or that are noisy to open and close -- these scenarios can be turned into a beautiful frameless neo angle shower in a very short amount of time. 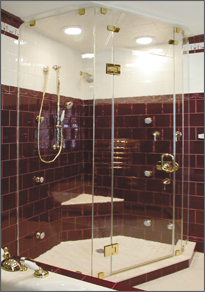 Most neo angle shower replacements can happen in about a week. 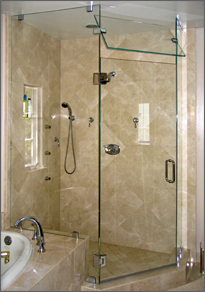 As long as you know the measurements for your space, we can fabricate your glass panels for your neo angle shower, assemble your hardware and finishing options, and install it in your home. 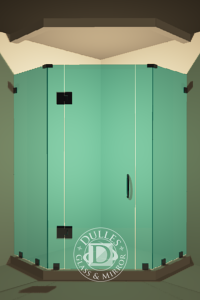 This is a simple upgrade that doesn’t involve gutting the whole bathroom -- but will be worth the time and effort, whether you are enjoying the bathroom for years to come or preparing it for resale. 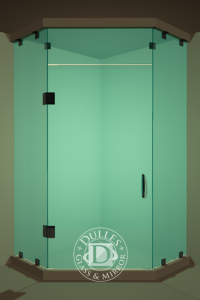 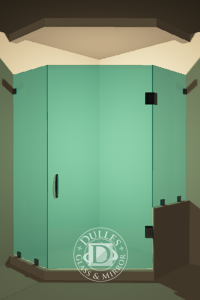 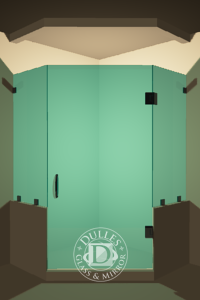 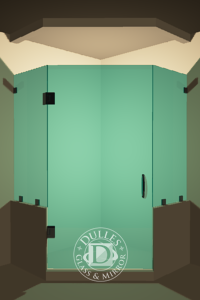 Dulles Glass & Mirror offers the most custom options for your neo angle shower enclosure. 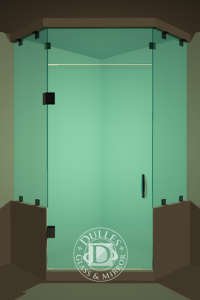 From the high-quality glass options to the sturdy, premium hardware options, you can customize your shower door just the way you want it. 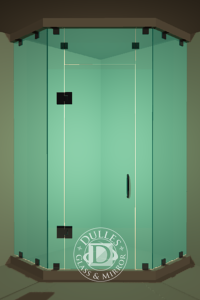 Browse the links below for in-depth guides to all your neo angle shower door custom options. 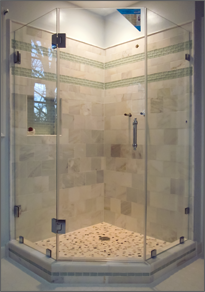 Shower Glass Thickness: 3/8" or 1/2" premium glass. 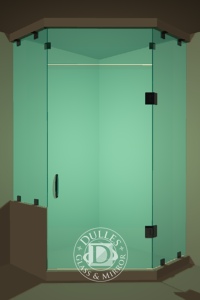 Shower Glass Panel Types: clear, HDglass, frosted, gray, bronze, and rain glass. 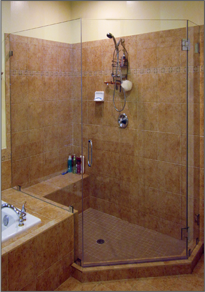 ClearShield Shower Glass Protector: Learn more about this special coating to keep your glass looking clean, fresh, and new. Shower Door Hinges: Learn more about how your shower door hinges create stability and durability. 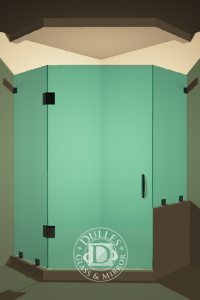 And, see our great styles! 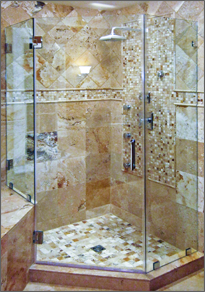 Shower Door Handle Styles: View all the styles you can choose for your new neo angle shower enclosure. Hardware Finishes: Chrome, brushed nickel, brass, and oil rubbed bronze.